I honestly think DH and I are gardening oddballs. 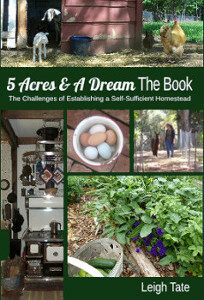 Let's face it, almost every homesteading and gardening blog and book I look at shows beautiful photos of beautiful gardens with beautifully constructed raised beds. It's the modern technique after all. We, on the other hand, have one large plot, which must be annually divided into new rows and beds, none of which are framed out. Here it is, the coop cleanings for the year, spread out (albeit thinly) over the lower half the garden, ready to be tilled in. And the heart of our outdated gardening technique is in the last phrase of the previous sentence, "ready to be tilled in". The thing is, my husband loves to till. He loves his tiller. He doesn't want to make raised beds. One can't till raised beds. So there you have it. But back to chicken litter, or in our case, the deep chicken litter method. keep it thick, loose, and stirred up, to keep the smell down. Two very different approaches to accomplish the same result, a nice smelling chicken house. Which works best? I've only tried one method, so I can't compare the two. What I can tell you is that the deep litter method, properly done, works. Our chicken coop does not stink. There is no manure odor. There is no ammonia odor. What's more, it's easy and the chickens love scratching around in it. Plus, it produces a goodly amount of pre-composted material. What you see in that photo is about 8 months accumulation of dried leaves, chopped straw, pine needles, chicken droppings (dried and fresh), feathers, hardwood ashes, old sawdust, shredded newspaper, and spilled food. I would call it disintegrated more than composted. This can either be added to the compost pile, or tilled directly in to the garden. This is what I spread on the garden. The biggest difference in these articles is that Robert Plamondon's information is based on a 1949 article, which recommends adding lime to help combat any ammonia odor. I didn't do that, but followed the other two articles, and did not add lime to the litter at any time. By keeping it stirred up and frequently adding more litter materials, we didn't need to. It is possible though, that the addition hardwood ashes, spilled by the chickens from their dust bath box, helps with this as well. It had disintegrated down to less than six inches by the time I cleaned it out. Then I added a new layer of dried leaves, and we begin the cycle again. The key is to use materials that don't compact easily and are easy for the chickens to scratch up. I don't buy anything special, I just used what I have on hand, including discarded bean pods from the beans I've been shelling. The day after it was tilled we raked it out, planted annual rye for a green manure crop, and rolled the seed into the soil. Just in time too because two days later we got a long gentle rain. What a relief to get the timing right on this one. Now we're just waiting for the rye to sprout. DH did a beautiful tilling job. So, maybe a still and your own home brand of Rock & Rye? Thank you Leigh for the info on the deep litter chicken coop method. It is very informative. The garden looks very nice! 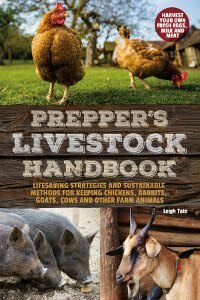 Never realized there was so much info on methods of keeping a chicken coop! Beautiful supervisor. We use the deep litter...our neighbors are so nice to let us have all their leaves as well...then they laugh at us and our chickens and deep littered hens. We do deep litter as well. I love cleaning it out a few times a year and putting all that goodness on the garden as well. 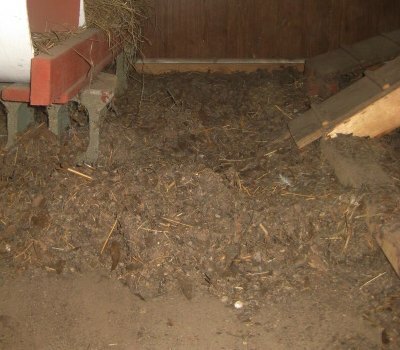 We use the same deep litter method in our chicken house. We clean it out once a year and it's amazing how close to the best compost the litter is at that time. It gets spread on the field garden and the raised beds. We do till our raised beds which are all 4' x 8'. We have a Mantis tiller (which is on the smaller side as far as tillers go) and it works well for us. In our pre-Mantis days, I tilled it all in by hand with a spading fork. The field garden gets done with our old but prized Gravely garden tractor. Tell your hubby, "Nice tilling job!" I love the looks of a tilled up plot. We're using the deep litter method as well. Just seems much easier. We use pine shavings though, not leaves. The leaves go straight on the garden for composting over the winter in the Ruth Stott fashion. We don't have raised beds here, nor do we have a tiller so this method works wonderfully. Plus I love the fact that it keeps the weeds at bay as well. I compost my coop cleanings. I managed to tip a wheel barrow load of dirty shavings from the chicks onto the garden and was amazed at how much heat they released over the next few weeks. You could feel the warmth by holding your hand near it. I'm extra careful now about composting it all first. Wow! He does love tilling! That garden area looks beautiful! sounds great! I hope your rye comes in great with all the care you've given it. Lynn, thanks. I hadn't even heard of the deep litter method before we got chickens. I'm glad I gave it a try though. Evelyn, given time, someone will make a science out of anything! City Sister, thank you for visiting and commenting! Lucky you to have neighbors like that. A wonderful asset! Bettina, it's interesting you should mention that type of bed. I just learned about that method so we're definitely going to give that a try, specifically in the front yard as I prepare more beds for herbs next spring. The cost of pressure treated timber is another factor, and why I never tried to persuade Dan to make a few raised beds. I'm thinking maybe we can border our front yard beds with bricks. Mama Pea, a Gravely! Dan would absolutely love to have one of those. More so than a farm tractor. Trying to find one is the key. New is out, and running old ones are far and few between. Still, it's on his wish list. Nina, good point about the heat. Chicken manure is a hot one. My litter is spread so thin, that won't be a problem, but it's something to keep in mind should I ever have the opportunity to put it on thickly. Just think how rich that soil is, it sure looks nice too! I was glad to discover that what I thought was being lazy....layering fresh straw over soiled because I didn't want to clean the run out....is actually called deep litter. It was good to read Harvey Ussery's article on the subject a few years ago & a surprise to read here that so many others are also practicing the method. Interesting that you have such a variation in your litter too, Leigh. When I do get a load of the old litter out I like it as a heating layer in the compost as well as on the garden after growing season is over. No raised beds here either, I really like to be able to move around in the garden as well as move things around & to keep things more natural. Michelle, you sound like me. I was so delighted to discover the deep litter method for the very reason of who really wants to clean out the coop so often. I love the Ussery's website. So much good information there. I'm glad to know we're not the only ones without boxed in raised beds either! Laura, I haven't been successful with deep litter for my goats and Charlie. They just pee a heck of a lot more than chickens and that smell is the problem. Maybe I'm not getting enough carbonaceous material in there, I don't know. I do have a cement floor in their shed, so there's nothing to absorb it. I can see too, how too much rain would be a problem. Carrie, I didn't specifically add the wood ashes to the deep litter. Rather, they were part of a dust bath mixture I made, of sand and hardwood ashes. Of course, the chickens are great at scratching in the dust bath box and dumping it out. I admit that it does get dusty in the coop when I'm stirring up the litter. The article cited says a little moisture is good for keeping the dust down, and I think it helps with the decomposition. It's definitely worth looking in to for your girls. I had never heard of a "chicken tractor" until I read Omnivore's Dilemma. Perhaps you could come up with one of those?? Though we don't till any more, we did combine the tilling with "raised" beds. 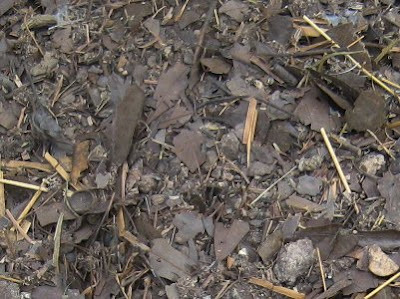 All winter we sheet composted garden wastes, kitchen wastes, straw, poultry bedding, and grass clippings. Because we live in the Willamette Valley, where it RAINS, we dried out the soil for tilling by covering the whole garden with black plastic for six weeks, which also added heat and killed weeds. Then we tilled. Then we marked the "beds" and raked toward them from the "paths." Then mulched both beds and paths with new grass clippings and planted through the mulch. The beds were maybe an inch-and-a half taller than the paths. Worked fine. But it was work. 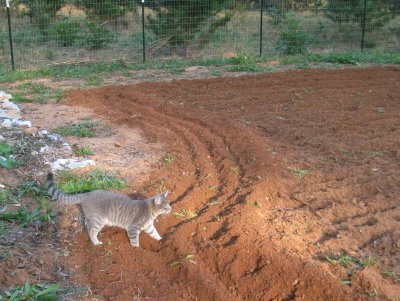 Now we're old so we do every step except the tilling, and include cardboard in the mix, to kill weeds and encourage worms. The worms do the tilling. So much easier, and there you have it. YMMV, though. Vicki you bring up several good points. I hadn't thought about leaching chemicals from pressure treated wood, just that they don't last forever and so need replacing sooner or later. The other point about their permanency is one of the reasons I'm having trouble designing my front yard herb garden. These will be permanent beds for mostly perennials, and I want to make sure I've got the design right. Dan understands the no-till concept here, because they are perennials after all. It will be a good way to learn the contrast in techniques for both of us. I would love to read John Seymour's book. Our library doesn't have it, alas. I need to look around for it. Sharon, we may yet build a chicken tractor! For the time being, however, having free access to the pasture is working well, so no need. If we ever maintain two flocks for some reason though, a chicken tractor may be the way to go. Risa, you are describing exactly what I want to try. My target though (since I can't talk DH out of tilling the big garden :), is our front yard. 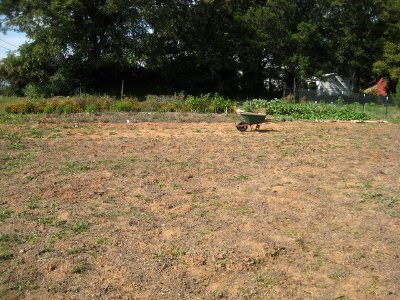 Currently all lawn, it is where I want to do edible landscaping, focusing on herbs and other perennials. Interesting that you had to cover your garden to dry it out to till! All that rain, would be a real gardening challenge. 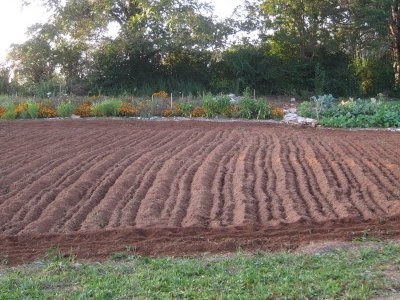 Mr H, I agree, there's nothing so lovely as freshly tilled garden earth. Interesting point about beds and plant disease. I had more problems this year with disease than insects, so I'm all for anything to help with that. I love the deep litter chicken method. It's great and our coop never smells. I can't imagine doing it any other way. I am jealous of your weed free garden. We have to figure something out to keep the weeds down in ours. I wondering if we need to get a tiller. The cardboard and straw method didn't seem to work to well for me as once it started raining the whole thing sprouted straw seed. ARG. Robin, too bad it doesn't stay weedfree, lol. I had the same problem as you with straw. Mine was oat straw and I never could get rid of that stuff once it started growing in the garden! That was awhile back, but I've never used straw for mulch since.